Maintaining the exterior walls of your home or place of business is vital in order maintain curb appeal and ensure comfortable conditions inside the property. These walls are not only highly visible to every passerby, but they also take the full force of Mother Nature, from the snow and freezing temperatures during winter to the hot, dry afternoons in summer. Acting as a barrier between you and these conditions is hard work and after fulfilling such a role for a number of years, it’s not unusual to see signs of wear and tear that can not only affect the appearance of these walls, but which can render them less able to resist the weather in the future. It’s at this point that parging services offered by Cummins Restorations Inc. become an option worth considering. We’ve been in business since 1992, and over the years we have spoken with a countless number of clients who contacted us due to damaged or unsightly exterior walls. When we said that parging was probably the best solution we were often met with a response along the lines of “Parging…I’m not quite sure what you mean.” When we refer to parging we are talking about the process whereby a mortar based mixture is carefully applied to the wall in order to re-finish it. What are the Benefits of Parging? Enhances Your Property’s Appearance – One of the main reasons for parging a wall is to improve its appearance. 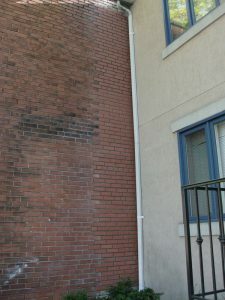 A wall that has been partially eroded and stained due to years of exposure to harsh weather conditions, dirt and fumes can have a significant impact upon the aesthetics of your building. Parging restores a nice smooth, uniform finish that enhances your property’s image. Another Line of Defence – As you well know, conditions in the Greater Toronto Area can be very harsh during the winter months and once damaged, the condition of an exterior wall can quickly deteriorate as water freezes and expands inside small cracks which form. While not altering the structure of your building, parging covers over existing cracks and protects your building from the weather. Why Work With Cummins Restorations Inc? Our staff has years of experience working in the industry, having successfully completed hundreds of masonry jobs in the Greater Toronto Area over the last two decades. We offer fast, reliable service and are renowned for exceeding customer expectations. If you are interested in parging, or any of our other services, contact us today.